When talking about mental disorders, people often recognize common mood disorders like depression and anxiety. A set of psychiatric and psychological disorders that might be less well known and talked about are somatic disorders, which are prevalent among 5% of the population. These disorders are exhibited when there is an over-occupation of a symptom like pain or fatigue that elicits an extreme reaction that causes an impairment of functioning in the individual. Often, these disorders are co-morbid with anxiety disorders. People who have somatic disorders are screened thoroughly for other possible disorders before receiving the diagnosis of a somatic disorder. Common symptoms of somatic disorders are specific generic indicators like pain, fatigue, or shortness of breath. There can be a single symptom present or multiple overlapping symptoms. The catch is that there is no underlying cause or medical condition that is causing the continuing symptoms. This does not mean that the suffering and pain that the patient is reporting is not real. Someone might fixate or worry over their symptoms and potential causes, believing that the symptoms are due to an underlying serious illness even though multiple tests have shown no underlying medical cause. Repeatedly checking for abnormalities in functioning, or believing that your medical state is serious even though there is no evidence is also a common symptom. For a diagnosis in somatic disorders, it is more about how you are interpreting and dealing with symptoms that is important. A more commonly known somatic disorder is hypochondriasis, where someone is overly focused on a symptom like fatigue, and believe that they have a serious illness like cancer. However, there are other subsets of somatic diseases. Another common somatic disorder is conversion disorder. This is when an individual shows neurological symptoms with no underlying cause found in the body, like paralysis, abnormal movements, hearing loss, blindness, or abnormal walking. It is not entirely clear why people develop this condition, but it functions similarly to anxiety disorders. 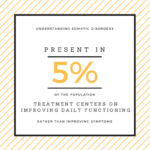 The treatment for somatic disorders focuses on improving people’s functioning in everyday life rather than focusing on their symptoms. A key factor that is addressed during this time is controlling and managing stress. Cognitive Behavioral Therapy (CBT) is also very helpful for those experiencing somatic disorders, which involves focusing on any underlying anxiety and addressing the erroneous belief that the symptoms are due to some kind of disease. If you are struggling with your mental health, or you know someone who might be struggling, please feel free to contact the professional team at Lifeline Connections for help! Getting yourself help, whether it is through self-help or by reaching out to professionals is an important part of recognizing that you are struggling; it is also a good step forward in getting the help you need. You can visit Lifelineconnections.org or call 360.397.8246 for more information.